As a member of LawNet, Cullimore Dutton is eligible to access ERA Legal services on preferential terms. Following an initial discussion between practice management staff and ERA Legal’s Lead Consultant Jason Adderley the firm invited ERA to review Records Management expenditure with a view to achieving tariff savings and improved commercial terms. Jason Adderley instructed ERA Legal’s Records Management Specialist Peter Lee to conduct an initial review of Cullimore Dutton’s current arrangements. This intervention was timely, as Peter advised Cullimore Dutton that it was in a contractual position serve “protective notice” on its existing supplier immediately and proceed to tender. 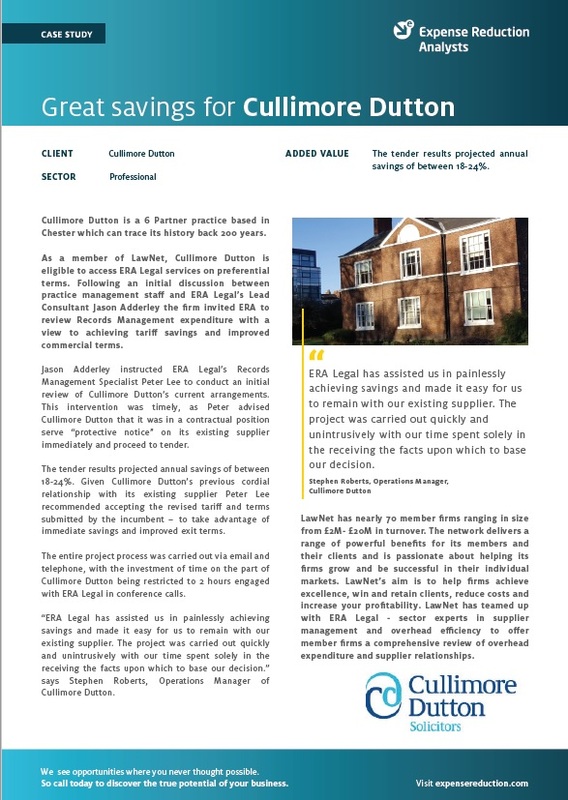 To find out more about how ERA helped Cullimore Dutton, including results, savings and more details from the client, download the full case study now.